The most common foreign substances that our scalps may be exposed to is the soaps and shampoos which we use on a daily basis. When choosing a soap or shampoo for an itchy scalp condition, one should consider some factors. Identifying what the source of the irritation should be the first concern and that can and should be determined by your Doctor or dermatologist. Alls soaps typically leave a residue behind after rinsing. This residue can lead to symtoms of an itchy scalp. In cases where soap residue is the cause of the scalp irritation. One may consider Puraderm Hair and Body Shampoo. Our soap rinses residue free. After washing and rinsing none of the product signature is left. Scent or fragrance is a great example of a residue. After washing your hands or scalp with a product, if you hands or scalp smell like that product, they have the residue signature on them. In general if you are looking to avoid an itchy scalp irritation you would want to avoid any products that have scents, Dies, Extracts, Vitamins, or oils. In this process of eliminating potential irritants, any additional ingrediants only further cloud the potential to discover the source of the irritated itchy scalp. Other products try to push “Natural”, “Free”, “Clear”, but they just don’t have what it takes to be Truly Residue Free. Skin creams and shampoos, will work better when used with Puraderm Products. Our (No Residue) Formula will remove dirt, oil, and other product residues to help prep the skin and scalp for a more effective application. Thank you for your time and consideration. 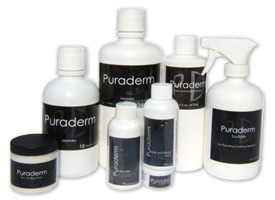 We have created a sample pack that allows you to try each of Puraderm’s eczema treatment and skin relief products. Please understand that each sample will cost us more to produce and ship than we receive from it’s order. Feel confident that if you are not totally satisfied with our eczema treatment products. we will refund your money.